Ralph says: Even though we have two more older cats, Jambo is searching for a buddy in his age. So we get his younger brother Leonardo four weeks ago. Now Jambo seems perfectly happy. Leonardo is his original name but most of the time we call him only Leo. Leonardo is the perfect buddy for Jambo to play with. From the day Leonardo came in our house, both are together the most time of the day. Leonardo is a very lovable cat but doesn't trust the photos. He's a deep one. When he runs through our backyard, often with a spiderweb in his fur, he's too fast for me and my camera. Thus the only chance to take not only blurry photos is the time he is laying on our -- sorry, his -- couch. 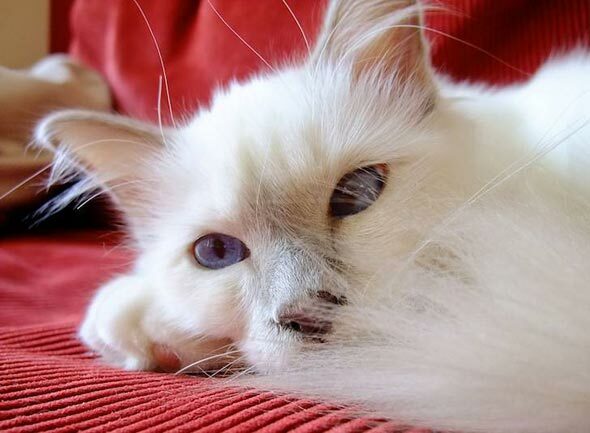 All Photos Courtesy of and ©: Ralph V.
Yes, both are birman and have perfect blue eyes. Also our third and youngest cat, called Sully is a Birman. All three are in best condition and enjoy a stressless, playfully life with many great meals and a lot of cuddling and love. Leo also has beautiful blue eyes. I think Leo's eyes are more violet than Jambo's--like Elizabeth Taylor's were. Two peas in a pod, or two Birmans in a clutch. Love this shot! A busy Leo in his garden; lovely! Mighty beautiful whiskers on gorgeous Leo. Any time you can reach out and find a perfect buddy for your currant buddyis a Win Win day. They l;ook like twins . As Norton would have said; "Nicely done Ralph"